Albert Arcand, who will turn 98 next month, smiled as he looked skyward at the southwest corner of Yonge and Wellington Streets on Thursday afternoon. Paying no attention to the chilly weather, he was joined by his son Claude, daughter-in-law Braendel, and grandson Stephane, all of whom looked up to the same spot: a photo of Albert, dapper in his Canadian Army uniform, looking down at them. 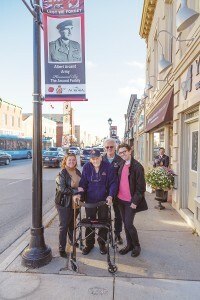 Mr. Arcand is just one of 17 Canadian servicemen and women – veterans, currently serving, and fallen – now gracing Aurora’s historic main thoroughfare who have more than just service for King, Queen and Country in common; they also all have close ties to Aurora. The banners are the result of a partnership between the local branch of the Royal Canadian Legion and the Town of Aurora to pay tribute to all those who have worn the uniform. 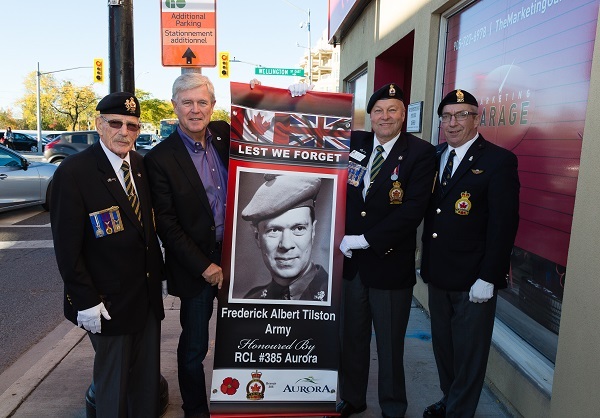 They were formally hoisted onto downtown light poles on Thursday, with veterans, Legionnaires, and sponsors joining Mayor Geoff Dawe for the ceremonial hoisting of the banner honouring Col. Fred Tilson, the Victoria Cross winner whose name is proudly borne by the Aurora Legion. His family, however, are full of appreciation, having sponsored his banner. “My father has always been a role model for me,” says Claude. “He was a career soldier who served for over 20 years. I remember when he was away for an entire year in Laos as a child. I missed him terribly, now I just want to honour him wherever I can. Stephane said he agreed, noting it was a celebration of the past and present. Also on hand for Thursday’s dedication were Beth Smith and her husband Paul. Beth was there to pay tribute to her late father, Norm Cook, who died last month at the grand age of 100. Mr. Cook was a prominent Aurora businessman and founder of Norm Cook Mensware. His banner is hanging just steps from his old business. The banner program is the brainchild of Legionnaires Ken White and Mike Rankin, who were inspired by a similar initiative in Uxbridge. “I said Aurora has to do this,” said Mr. White. “I am ecstatic it is up there. I want more. Now we have 17 up and I want to see another 17. Having said that, there have probably been five people who approached me to get banners up since yesterday, so I am sure we will fill it up quite nicely. There are 34 poles we have available so I would like to see them all filled. The banners will be flown on Yonge Street through Remembrance Day. They will return to the polls each year from October 1 through November 11. Each banner has a life expectancy of three years after which they will be replaced and the torch will indeed continue to burn.